Since March I have been conducting a comparison test of two different TPM systems. When I started in March the Ambients were down near freezing. I completed my comparison at the end of July with the ambient temperature above 90°F. I started by checking the accuracy of the various sensor pressure readings. The summary of that post indicated there was no meaningful difference between the systems for pressure readings for the 12 sensors I tested. In THIS post I confirmed the temperature readings were also essentially the same by comparing the morning readings after a night long temperature soak. The next step was to see what the systems reported for the hot running temperatures. I expected that the numbers from the internal system would be higher than the numbers from the external sensors. The reason for this is that the external sensor is actually reading the temperature of the outer end of the metal valve stem that is wiping around in outside air being cooled. The small collum of hot air inside the valve stem just can't transfer enough heat as fast as the metal (brass) valve stems is being cooled off. Here are the numbers. But I had to wonder if the cold ambients might somehow be skewing the data so, knowing I was planning to travel to Indiana in April, Michigan in June and Wyoming in July I was hoping that the ambient temperature on one or more of these trips would be significantly warmer than my March trip. In June I posted my opinion on the value or lack thereof of temperature readings from TPMS. This opinion was not based on any specific results from my testing but just from some serious contemplation to tire temperature recording I had been involved with when working on Indianapolis race car tires and my observations in test laboratories while I worked as a tire design engineer. Back in May 2012, I posted some actual running temperature images recorded by some high priced laboratory instruments. You can see the results here. Clearly using a handheld IR gun after you come to a stop or depending on the temperature of the air inside the tire, which is obviously an "average" of the hot and cooler areas of a tire, is not going to give you a reading of the hottest part of a running tire. 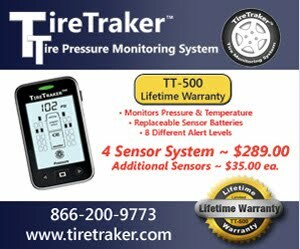 If we are concerned about the advanced warning of a tire failure, tire temperature numbers from a TPMS is not going to be sufficiently precise to identify the temperature of the hot spot. While high temperature can lead to a tire failure, the failure will most likely occur at the hottest spot which is not the "average" of the internal surface of a tire. Also, extended periods of time at elevated temperature can contribute to the degradation of rubber which could eventually lead to a failure like a belt separation while never being hot enough to set off the high-temperature alarm. Finally, in July, I could review the results of my readings with higher ambients of the different readings observed with the internal TST 507 system vs the external Tire Traker system. In mid-Aug I posted the test results of the external Traker system vs the internal TST system. OK, so what is the bottom line? IMO the performance of the two different systems is similar enough to make recommending one over the other impossible. There is a cost penalty with the internal system of a little over $100 plus any purchase price difference. Looking at the two different web sites I find the 6 sensor Tire Traker system with booster available at $398. The Truck System Technology 6 sensor internal system with the booster is listed at $599. You will need to figure there will be an extra charge to pay for the dismount, mount, and balance of the internal system. I had the TST system installed locally for $109.07 which would bring my total to $708. To answer the question some of you may have. I purchased and use a Tire Traker TPMS in 2009 befroe I started this blog and plan on continuing with that system for the foreseeable future. When should you replace your tires? HOW OLD is too old? A lot of folks talk about tire age and when they "age out." Japan Automotive Tyre Manufacturers Association (JATMA) recommendation: At 5 years have tires inspected by "Qualified tire service person" and no matter the condition replace any tire at 10 years. Bridgestone & Firestone issued a Tech Bulletin that supports the 10-year maximum but advises that "some tires will need to be replaced before 10 years due to operational conditions. Michelin, Falkin, Yokohama and Vredestein suggest tires be inspected by specialist annually starting at 5 years and replaced at 10 years as a precaution "even if such tires appear serviceable and even if they have not reached the legal wear limit"
Hankook says to replace tires 10 years after manufacture "even if the tire was never used"
Goodyear, Continental and Cooper do not give a maximum calendar age but stresses "Monthly Inspection" along with proper storage and monitoring of inflation pressure. Kumho says to have tires inspected annually starting at 6 years and to replace the tires at 10 years, even if the tires appear serviceable. Vredestein suggests tires be inspected by specialist annually starting at 5 years and replaced at 10 years as a precaution even if such tires appear serviceable and even if they have not reached the legal wear limit. They also say that tires on trailers, campers, horse trailers and caravans (motorhomes) be replaced at 8 years. They are talking about the annual inspections after 5 years to be done by a "Tire Specialist", not just anyone that sells tires. I would suggest that when having this inspection done you ask for a written assessment as a minimum. You can ask if the dealer has an ATS Certified Technician on staff. Since March I have been conducting a comparison of a couple different TPM systems. One from TST has internal sensors, as seen here. Please note this shot shows the TPM sensor and the steel band retainer. I was in the process of removing the extra band material as this is a 16" wheel. A larger wheel would need a longer band. The other from TireTraker has external sensors that screw onto the end of your metal valve stems. Or as I did on the end of my dual tire extension hoses seen here. I also had some TST external sensors that mount on valve stems and look very similar to the TireTraker brand sensors. This is the final post on the direct comparison of different sensor location. I previously posted results HERE but there was a question raised as the internal system was one brand from TST and the External sensors were from TireTraker. We needed to learn if the minor differences were due to the different brand or the different sensor location. To accomplish this I mixed the external sensor brands and used three external sensors from TST vs three from TireTraker. Here are the numbers. Ambient was in the upper 80s to lower 90s for this part of the test. Now I realize that reading the above doesn't make the differences and similarities obvious or even easy to see so here is a summary of the findings. TST system External temperature readings run 20F to 30F cooler than TST Internal temperatures. TST internal temperatures readings run 15 to 33 (average 25F) hotter than Tire Traker external temps. Reviewing the above results and the results posted in the July 20 report and the two March reports from tests with Ambient in the 30s and 40s, it is my considered opinion that both TST and TireTraker systems provide similar numbers for inflation pressure and that external sensors report temperatures that are 20F to 30F cooler than internal sensors for both brands. Given the above comparison on the data readings, I would consider these two systems a toss-up for reporting the temperature or pressure, as long as you remember that external sensors are being cooled by external ambient so will report 20F to 30F lower temperatures. There are some differences between the two systems and some of these are subjective. I will cover these differences in a future post. Do inner duals fail more often? If so, why? "Isn't it weird how it always seems to be the inner tire that goes bad or blows? Seemed to always be my experience (bad luck) when I was driving semi's for a living." While I have never seen a documented study, I can certainly believe this observation can be made by many. There is Science behind the "Why" this may be true. For those that have reviewed the post on Tire Covers that explains the effect of temperature on tires, you have learned that it is the higher temperature that accelerates the tire "aging" process. If you look at the temperature readings on sets of dual tires you will see that when the tires are inflated to equivalent pressures the temperature of the inner dual on Motorhomes will usually show as a bit hotter. The difference isn't a lot but the effects of that difference I believe are cumulative. It is also true that older tires are more likely to fail due to the degradation of the rubber flexibility and strength. Please do not take this observation and assume you need to start adjusting the inflation in your duals to run more air in the inner tire. Doing this could end up resulting in a shift in loading between the pair of tires to place more load on the inner tire, and we know that increased load results in increased operating temperature. Tire operating temperature develops from complex actions of flexing of the belts and of the lower sidewall which are the two hottest locations on a tire. You might be able to lower the temperature in one location while increasing the temperature in a different part of the tire. 1. Confirm the tires in each pair of duals are a "Matched Set" (See THIS older post). 2. Ensure you know the actual load on each set of duals not just the total axle load. 3. Use the Load and Inflation tables to learn the MINIMUM Cold Inflation Pressure for the heavier loaded axle end. 4. Add a 10% inflation to that minimum number to establish your CIP. 5. Inflate all tires on the axle to the same CIP. (matching the inflation within +/- a couple psi is good enough. 6. Run a TPMS to monitor your pressure whenever driving. Can you change tire size on your RV? There seems to be a bit of confusion when it comes to selecting tires to replace the size/type that came as Original Equipment on your RV. What you can do and what you should do are not always the same thing. Here are some statements collected and posted by a knowledgeable person who frequently responds to questions on some RV Forums. "Goodyear: Never fit tires to a vehicle that have less load carrying capacity than required by the Original Equipment Manufacturer. Michelin: Never choose a tire that is smaller in size or has less load-carrying capacity than the tire that came with the vehicle. Cooper: The new tires must have a load carrying capacity equal to or greater than the maximum load carrying capacity specified on the tire placard on the vehicle. Toyo: Any replacement tire must be of a size and load range that will offer equal or higher load carrying capacity compared to the original equipment (OE) tire on the vehicle." I am not aware of any "legal" requirement that specifies what the RV owner is required to do. While it is a legal requirement from DOT that the vehicle manufacturer must select and specify tires and the inflation necessary to support the stated Gross Axle Weight Rating, as far as I know, this legal requirement does not apply to individual owners of vehicles. HOWEVER, I doubt that you will find any company or responsible individual willing to state that it is good practice to select replacement tires that do not have a stated load capacity that is equal to or greater than the load capacity of the original tires. All tires sold for use on public highways have a stated maximum load capacity at a given inflation pressure molded onto both sidewalls. This fact, along with the information in published Load/Inflation tables, makes it relatively easy to find tires with the needed load capacity. There are a number of reasons to consider an alternate size tire (availability, cost, brand reputation, etc.) but in every case you should only select new tires that can support at least as much load as the OE tires. The above is based on an assumption that the load on your tires is split equally 50/50 side to side on each axle. Since this is seldom the case, this is an extra bit of information you should consider when shopping for new tires. I have numerous posts on this blog where I outline the importance of confirming the actual load on each end of each axle. This is because it is possible to have the load unbalanced to the point that one tire may be overloaded even if the total tire load capacity for all the tires on an axle numerically exceeds the total axle load measured on a truck scale.